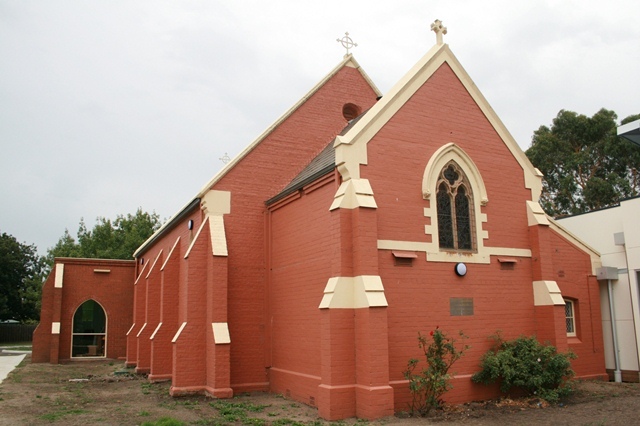 On Friday 27 May 1864, the laying of the foundation stone of the Church of St John the Evangelist, was announced in the Melbourne Argus, wedged between reports on the latest government failures in trying to dredge the Murray river—the new iron punts sent north were ‘worth than useless’ and fit only as fish tanks—and a notice on a recent lecture on ‘Shakespeare as a Politician and patriot’ (The Argus, 27 May 1864, p. 5). On the paper’s front page Messrs. Money Wigram and Sons of Blackwell Yard London advertised their direct passage to London on their ‘well known clipper ships, which have been built expressly for the Australian passenger trade’ to depart on Saturday June 11, ‘with strict punctuality’ and scheduled to arrive 68 days later. The rival line, the Aberdeen Line of Packets, advertised the services of its passenger ship, the Garrawalt, to sail ‘positively on 20 June’, praising ‘her very roomy cabin accommodation’, though without providing any estimated arrival date. Getting to the colony of Victoria was a long and, the adverts in the Argus rightly suggest, arduous journey. The fact that the inner pages of that day’s Argus contained a detailed list of the people and goods safely received from England by ship makes that abundantly clear. Victoria at the time of the foundation of St John’s Cranbourne was not only a faraway but also a divided society: Dean Macartney’s extensive obituary in the Melbourne Argus paints a picture of a society struggling to maintain a sense of unity of purpose, and challenged by an increasing materialism and secularism: ‘At a time like the present, when phases of belief and unbelief succeed each other with bewildering rapidity, and when a good many men seem to get a new creed every time they get a new suit of clothes’, Dean Macartney’s ‘unswerving fidelity’ to his faith and values ‘must compel admiration’, his obituary reflected (The Argus, 9 October, 1894, p. 5). It was into this society that Hussey Burgh Macartney came in January 1848, leaving behind a similarly divided society in Ireland, still marred by outbreaks of cholera and the potato famine, and moving to a new life in another part of what was then the world’s most powerful empire. In our second lesson (Ephesians 4.1-16), the apostle Paul also speaks into the context of a divided empire. Writing from the capital city, Rome, to a newly-established church on the fringes of Roman rule, Paul appeals to the congregation he founded in Ephesus to keep unity and peace: ‘bear with one another in love’, he tells them, ‘making every effort to maintain the unity of the Spirit in the bond of peace’. The key to maintaining unity and peace, Paul tells, is to respect the calling of others as much as one’s own call to ministry. We all are ministers together, Paul explains. Each one of us is called to ministry, and each one of us has a different gift to contribute to the life of the church: ‘there is one body and one Spirit, just as you were called to the one hope of your calling’ (Ephesians 4.4). Though we may all have different gifts, and Paul goes on to list the difference of gifts one can expect to find within a city such as Ephesus, we are to foster everyone’s gifts by looking out for one another, ‘with humility and gentleness, with patience, bearing with one another in love’ (Ephesians 4.2). For Paul the unity of Spirit within a church is as important as knowing that all people are called to serve God. In fact, unity of spirit is one of the hallmarks of the church, Paul says. This is how we know that we belong together, when we are united in what we believe: ‘there is one Lord, one faith, one baptism, one God and Father of all, who is above all, and through all and in all’, Paul assures the divided congregation of Ephesus (Ephesians 4.5). Because of Christ’s forgiving love for us, we also need to be prepared to forgive, he reminds them: ‘in Christ Jesus you who once far off from the covenant of Israel have been brought near by the blood of Christ. For he is our peace; in his flesh he has made both groups into one and has broken down the dividing wall, that is, the hostility between us’ (Ephesians 2.13-14). The divisions between members of the Ephesian church were as deeply rooted as those in Victoria at the time of the founders of this church. Indeed, many of the problems Paul addressed were among those faced by Dean Macartney and his fellow pioneer ministers—Victoria was divided on sectarian lines, and the ‘doctrinal comprehensiveness’ of the Anglican Church was, then as now, ‘its pride and peril’, as the editor of the Argus rightly observed in commenting on Macartney’s death (The Argus, 9 October 1894, p. 4). But even though Paul’s Ephesian church was divided on doctrinal lines, as was Victoria in the days of the founders of this church, Paul was confident that these divisions could be overcome. In his epistle he identifies two things that can help overcome division and promote unity: an active response to God’s call in our lives, and an active way building up one another and the communities of which we are a part by living out that calling, ‘in Christ you also are built together spiritually into a dwelling-place for God’, Paul assures the Ephesians (Ephesians 2.22). And the way in which we are being built together is by identifying the gifts that each of us can contribute to the work of ministry. Dean Macartney gift was not to be ‘a great preacher, nor an original thinker’, the editor of the Argus wrote. In spite of his lack of eloquence and erudition the editor concluded that ‘Dean Macartney, [although] he had not the great gifts of or the shining attainments which arrest men’s imagination, yet had qualities which disarm criticism and which won for him universal confidence and affection’ (The Argus, 9 October 1984, p. 4). And that, our epistle tells us, is precisely the point of a Christian community: not all have been given all of the infinite riches of Christ’s gifts, yet all have a gift that is of God, and is a valuable, a costly addition, to the work of ministry. As Paul assured the Ephesians: ‘The gifts he gave were that some would be apostles, some prophets, some evangelists, some pastors and teachers, to equip the saints for the work of ministry, for building up the body of Christ’ (Ephesians 4.11-12). If then the first Dean of Melbourne was a great apostle—in the sense of someone sent to found a church—rather than an eloquent preacher, then that, also, is a good reflection of the variety of gifts given by God. Christian ministry is not meant to be exercised on one’s own, but is a corporate responsibility of the entire church community: it is when we choose to go our own way, Paul tells the Ephesians, that we risk division, risk being ‘tossed to and fro and blown about by every wind of doctrine, by people’s trickery, by their craftiness in deceitful scheming’ (Ephesians 4.14). Only when we come together to discover both the gifts that lie within us, nurturing those gifts, and look out for the gifts of others, seeking to discern and nurture those, that the church can be built up into a living and active body that is, as it were, ‘joined and knitted together by every ligament with which it is equipped, as each part is working properly, promotes the body’s growth in building itself up in love’ (Ephesians 4.16). It is this kind of building—the building up of the spiritual body of Christ on the ‘foundation of the apostles with Christ as chief-cornerstone’ (Ephesians 2.20)—Paul says, that is as important as the other kind of building—the physical building of a house of prayer, where, during the years, you and your forebears have come to know that prayer has been heard and granted, love celebrated and ministry built up. As we celebrate the 150th anniversary of the laying of the foundation stone by my predecessor Dean Macartney, I want to encourage you to search within yourselves for the gifts that lie deep within you. Treasures of ministry that equip us to build up and maintain not only physical places where Christ can be known and encountered, like the beautiful church building we celebrate today, but ‘living temples’ built from people who know that they each have a gift to contribute, who know that they each have a part to play in God’s ministry in this place. For it is when we discover the gifts of ministry within us, and allow them to flourish in others, that we have the opportunity to overcome the divisions and segregation among Christians that the first-century pioneer-minister Paul and his nineteenth-century successor Dean Macartney knew only too well, and that may still ring familiar to you today. So, as we give thanks for the foresight and vision of our founders, it is my prayer for you and for me, that we might be faithful ministers in our own generation. I invite you to ponder your own calling, reflecting on what it is that God might ask of you to serve him in this community and in the wider church. And I encourage you to look out for one another as you embark together on the next chapter of the story of this Church, travelling together into a future that is every bit as exciting, challenging and uncertain as the futures St Paul and Dean Macartney faced. May that future be one where together we join in bringing to life the vision at the heart of today’s epistle, ‘equipping one another for the work for ministry, building up the body of Christ, until all of us come to the unity of the faith and of the knowledge of the Son of God, to maturity, and the measure of the full stature of Christ’ (Ephesians 4.12-13). Now to God who, by the power at work within us is able to accomplish abundantly more than all we can ask or imagine, to him be glory in the church and in Christ Jesus to all generations, forever and ever. Amen (Ephesians 3.20). By melbournedean in My writings and sermons on July 6, 2014 .